To start with painting, introduction to different types of mediums and tools is a necessary thing. There are many different mediums used by artists all over the world like, oil, acrylic, watercolor, ink, fresco, gouache, enamel and many more. Sometimes artist prefer using only one of these or may mix the mediums, totally depending on their choice, expertise and style. Each painting medium has its own characteristics and methods to achieve the desired effect. For novice painters, using acrylic paint is comparatively easier because the medium is flexible and durable. Acrylic paints are fast drying paints, which are easily available at any stationary store near you. These are easy to use water-soluble colors and become water-resistant when dry. 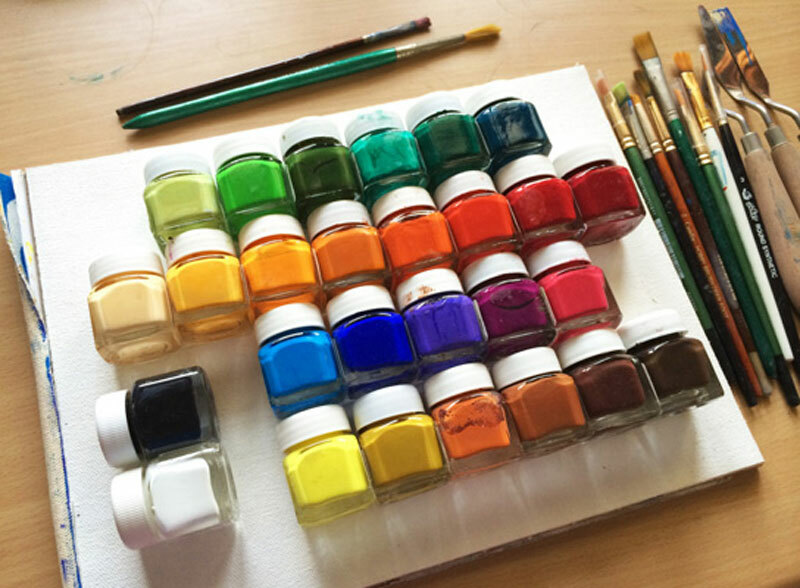 Depending upon how much color is diluted in water or oil; a finished acrylic painting can resemble a watercolor or oil painting, or have its own unique characteristic. The quick drying nature of the acrylic colors makes it is easy to work with in terms of storage, especially if you are working on a canvas as you can just roll up the canvas without the fear of paint being cracked or damaged.